We are in receipt... — There is no "Away"
We are in receipt of your most recent letter. As usual, we appreciate you taking the time to share your concerns regarding what you allege to be a "huge amount of plastic in the ocean". At this time we would like to request that you remain civil in future communications, whilst refraining from hyperbole. Saying it is a "huge amount" could upset the human public. 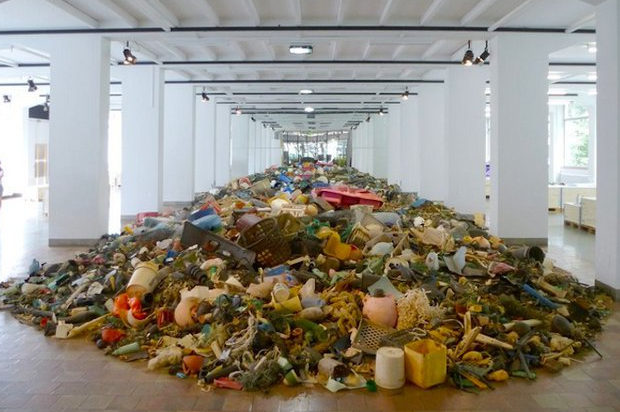 For the most part, it won't, because not that many people are paying attention to it, but hypothetically, humans could be disturbed if forced to visualize say, how much plastic enters the oceans every fifteen seconds. See? "Huge" sounds and looks disturbing. We concede that this amount of plastic waste is "unsightly", but when it's underwater, we can't see it. To be frank, this is the price society pays for convenience - for progress. Director of Zurich's Museum of Design, Christian Brändle calls this "the Legacy of Our Consumer Society". But to your specific point about the laser-cut plastic confetti, I have made note of your repeated complaints per this item. I can see how it might cause intestinal discomfort, and eventually a miserable starvation if ingested, so no disrespect, but it very clearly says "Happy Birthday", I'm just not understanding why you guys are still mistaking this for food. And not for nothing, it was a kid's birthday, I don't expect you to understand, but these are very important milestones for humans - you should have seen this kids face when they scattered all that plastic confetti around the picnic table! Actually, the kid didn't really notice it because the table was covered with presents all wrapped up with curly ribbon (don't start) and funny little plastic lizards (you can see them in the photo below, actually you can probably see them where you are too - they're cute, right?) At any rate, I will recommend that needless plastic pollution is included on the agenda of the next Meeting of Sincerely Urgent Things that move at the pre-global-warming-glacial-pace, again because clearly I have nothing better to do with my time. But don't worry, look how fast we moved on the whole plastic bag ban. There are currently 132 cities and counties around the United States with plastic bag ban legislation (you're welcome). According to the National League of Cities, where the number of municipal governments (cities) in the United States comes in at 19,429, that means that just under 1% (.6% if we're being technical) of cities have bag ban legislation. I know, it's unreal. Just goes to show what you can do when you put your mind to it. Let's keep the dialog open, I'm here to help.